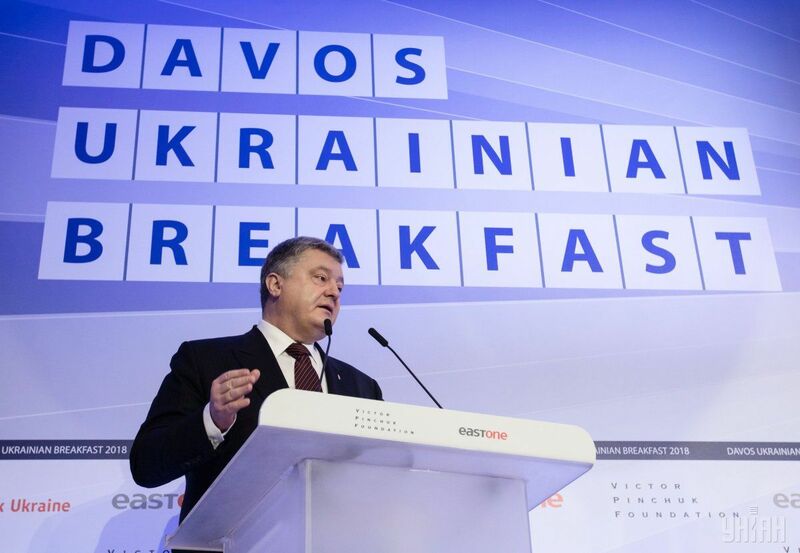 Last week, President Petro Poroshenko led a delegation of Ukrainian officials to the World Economic Forum in Davos, where he persuaded IMF Managing Director Christine Lagarde and potential investors in the country’s readiness to continue reforms and fulfill conditions for receiving another tranche of the loan, the National Bank improved its outlook for economic growth for 2018, at the same time pumping up its key rate aiming to tackle inflation, while Naftogaz in an attempt to push the government to accelerate the gas market reform, requested a UAH 110 bln compensation from the budget. This week all eyes were on the World Economic Forum in Davos, Switzerland, where for almost half a century, the world’s wealthiest and most influential people from dozens of countries each year discuss the pressing problems of global economy. Ukraine this time chose not to stay away from the epicenter, taking an active part in the forum. A rather massive delegation from Kyiv was led by President Petro Poroshenko. Literally, immediately upon his arrival in Davos, the head of state held one of his most important meetings there – the one with the Managing Director of the International Monetary Fund, Christine Lagarde. “I am very pleased with the last 6 months, when we introduced many reforms. Today, we agreed to continue efficient cooperation in various spheres and fulfill everything we agreed on today and in the past. I am grateful for a very strong and efficient cooperation,” Poroshenko said following the talks. It is possible that during the meeting with Lagarde the issue of the establishment of the High Anti-Corruption Court was discussed. Indeed, almost all western partners, including the IMF and World Bank, criticized in one way or another the relevant bill submitted to the Verkhovna Rada. Being aware of this, the president during the speech at the Ukrainian Breakfast, hastened to assure - all necessary amendments will be submitted as the bill will be prepared to its second reading. Moreover, Poroshenko said that Ukraine had fulfilled 80% of IMF requirements, and expressed hope for the allocation by the IMF of the fifth credit tranche as early as April. "Probably 'fingers crossed' before April we will have a mission [of the IMF] and have the next tranche," the president told Bloomberg. Poroshenko has stated that the top investors are still interested in Ukraine. "I am proud that this year, for the first time, I received a lot of requests from the foreign investors to hold a meeting. A great number of top players of the investment market. This has never happened before," the president said. According to him, thanks to the reforms, the investment climate in the country has improved significantly, and further steps will be taken. In particular, the head of state promised to replace a corporate profit tax with a tax on withdrawn assets for taxation of investment at zero rate, as well as to conduct privatization according to the norms of the new law, enabling investors to make transactions under the British legislation. Also in the framework of the forum, Poroshenko met with Vice President of the European Commission for Energy Maros Sefcovic and eloquently promised him continued reforms in this area. The National Bank radiates optimistic about the future of the Ukrainian economy. This week, the NBU following its Board meeting improved the outlook for the growth of the Ukrainian economy in 2018 to 3.4% from the earlier 3.2%. "The main driver of economic growth will be private consumption - thanks to the continuing high growth rates of real wages, as well as other incomes, including pensions. In addition, liberalization of fiscal policy will contribute to this. Also, active investment activity of enterprises will be preserved," the National Bank believes. In addition, according to the regulator, the growth of the economy will certainly be affected by the strengthening role of exports due to the positive conditions for trade and expansion of access to foreign markets. At the same time, the growth of exports will support restoration of production in certain industries, which in the previous year lost access to the products of enterprises located in the territory of Donbas beyond government control. As for inflationary processes in the country, NBU expectations are not so comforting: the regulator worsened the inflation forecast for the current year from 7.3% to 8.9%. The NBU noted that inflationary pressure will be conditioned by a number of factors, among which is the growth of consumer demand caused by the increase in social standards, a delay in IMF financing, high inflation expectations of the population, etc. However, the National Bank predicts that consumer inflation will gradually decline and reach the target level of 5% in mid-2019. The NBU decided not to let the problem go with the flow and moved to tame inflation by raising the key rate by 1.5 percentage points - from 14.5% to 16%, also announcing plans to pursue a tight monetary policy in the future if there are no signs of lower inflationary pressure. Meanwhile, the national currency has taken a course toward strengthening. By the end of the outgoing week, the U.S. dollar could be bought in Kyiv exchange offices for UAH 28.50 and the euro – for UAH 35.5. At the same time, the dollar could be sold for UAH 28.30 and the euro – for UAH 35.20. 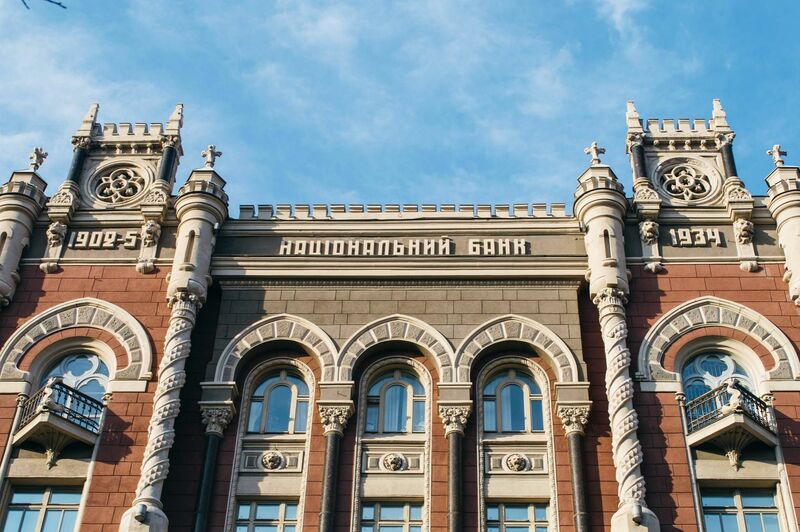 According to the National Bank, the weighted average rate of the hryvnia on the interbank market was set at UAH 28.5655 to the dollar by 12:00 on Friday as the market participants had concluded 180 deals by then totaling $91.88 million. By the way, assessing the results of 2017, the National Bank lowered its forecast of economic growth by 0.1 percentage points, to 2.1%. The State Statistics Service confirmed this target, having published stats on industrial output, which also showed a 0.1% decrease compared to 2016. According to the chief economist at Dragon Capital, Olena Belan, industrial output in 2017 deteriorated year-on-year due to the severance of economic ties with Donbas in the first quarter of 2017. This negatively affected production of steel, coke, coal and iron ore, as well as electricity. In her opinion, negative factors were compensated by the revival of sectors not affected by severed Donbas ties, namely: in mechanical engineering (+7.3% in 2017 against 2016), chemical industry (+17%), and food industry (+2.7%). "We expect that industrial production will recover by 3% this year on the back of further growth in engineering and other industries, as well as due to the absence of negative factors related to Donbas," Belan said. Chairman of the Board of Naftogaz of Ukraine, Andriy Kobolyev, was also at the forefront of the outgoing week. But this time it was not because of the victory in the Stockholm Arbitration, but over his row with the government. 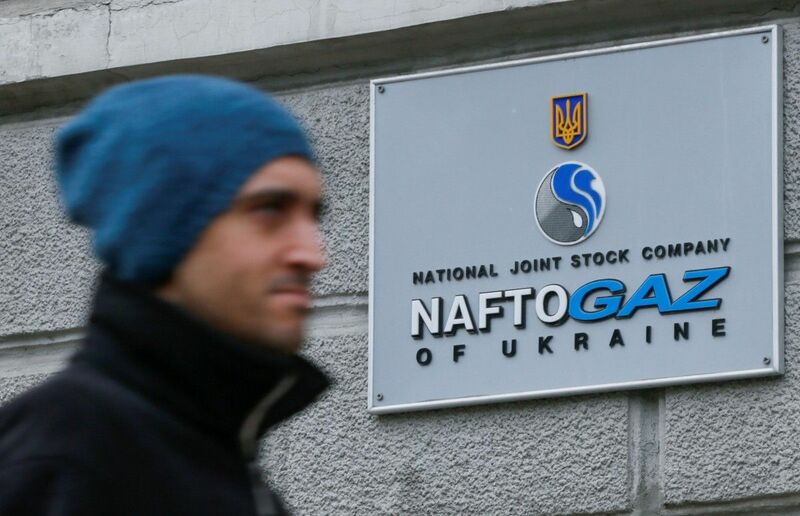 The thing is that Naftogaz submitted a letter to the Cabinet demanding that the government pay Natftogaz and its subsidiary company, Ukrgazvydobuvannia, some UAH 111 billion in compensation. Naftogaz believes that the company has the right to claim this money, since it has for a long time been supplying gas to the population at prices lower than the market price. The possibility of obtaining compensation is provided by the Law on the Natural Gas Market. In addition, Naftogaz in its appeal noted that it supplies gas to regional gas distribution companies owned by businessman Dmytro Firtash, and these companies fail to pay their bills. The debt has exceeded UAH 26 billion. "The current scheme of imposing special obligations harms the state, consumers, and market development. This scheme’s existence has over the past two years cost a considerable amount of money, which we estimate at over UAH 110 billion," Kobolyev said, adding that without the completion of the gas market reform, ambitious plans to increase own gas production, refrain from gas imports, lower gas prices for the population, and implement large-scale energy efficiency measures will remain on paper. According to Oleksandr Kharchenko, head of the Energy Research Center, Kobolyev does not aim to get money from the government, only seeking to force the Cabinet to speed up the reform of the gas market, namely, to create conditions for the emergence of alternative suppliers. "I don’t think that someone in Naftogaz expects to receive UAH 110 billion from the Ukrainian budget – they know in what position it is today. I suggest their main goal is to force the Cabinet to continue reforming the gas market ... Naftogaz did it publicly in order to push the Cabinet to further steps so that a compensation mechanism was developed," Kharchenko said. Meanwhile, there are many who show no support for Naftogaz actions. For example, head of the Center for Globalistics “Strategy XXI”, Mykhailo Honchar, calls Naftogaz requirements to the government an actual extortion. According to him, the holding’s steps are aimed at either getting a compensation, or raising tariffs for gas for the population. "These guys [Naftogaz management] have been playing so foul that they might get themselves fired because their appetites have become huge. Nobody underestimates their success, but if the approach of “we keep raising our own wages and demand more money from the budget" prevails, the government will take radical steps and enjoy public support in this regard," Honchar said. The fact that there is clearly a barely concealed conflict between the company management and the government is evidenced by the reaction of the Cabinet’s representative in Parliament, MP Vadym Denysenko (BPP). "Why would Naftogaz need this? In its financial plan for 2018, Naftogaz sought to increase the budget of their HQ by UAH 2.2 billion (a six-fold hike from the past year) and to raise the average salary in their HQ up to UAH 156,000 (these are the official figures that Naftogaz submitted to the Cabinet of Ministers for approval and which the Cabinet has rejected)," the deputy wrote on Facebook. Only in February, after the Stockholm Arbitration hands down its final award in the gas transit dispute with Russia, will we see in what the conflict will result and whether the government and Mr Kobolyev are able to reach a compromise.